As with most popular system, it's unavoidable that some great games are lost in the sea of games with some who at the very least leave an echo in many gamers' mind, those are what we call "Sleeper Hit". And there is no greater "sleeper hit" last gen than Valkyria Chronicles. Valkyria Chronicles is developed and published by Sega, one of the few titles that Sega got right, for the PS3 system. It's an SJRPG with one crucial different, instead of box movement, we get an energy bar that depletes by the number of steps as well as the ability to aim instead of simply choosing a command. But the biggest draw to the game is actually the CANVAS engine which gives the game a watercolor painting look to the graphic, ultimately making the game feel like a moving painting. Fun fact - During the very early stages, Valkyria Chronicles was going to be exclusive to Xbox 360 but that changed shortly after and made into a PS3 exclusive. Cool, so what is the plot? I'm glad you ask. The game takes place in a fictional continent call Europa (Can you figure out the real life counterpart? Starts with an E and ends in an E), during the early stages of a second world war between the Empire and Gallia. As the Empire invades and advances onto Gallia, Welkin and his adopted sister Isara, a Darcsens descendent (a race that is often persecuted in the game), has no choice but to flee their home. 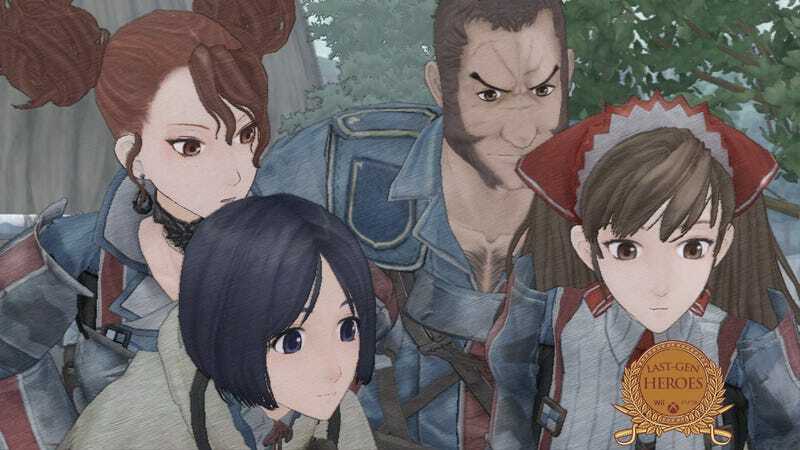 Upon fleeing, Welkin eventually winds up meeting up with Alicia which all three of them enlisted into the Gallian Army. The story follows Welkin and Squad 7 as they fight the Empire and bring peace. Interesting, sounds like it would be a neat anime, but how's the gameplay? Never. mention. the. anime. The gameplay is rather unique and as I've mention above, instead of limit to amount of box movement, you are given an AP gauge which limits your movement. On top of that, actions require command points so you'll have to decide who to move and who to use to fight during each round carefully. Tread careful, while it maybe an SRPG, enemies are still firing if you step within their range. At the beginning of every mission, you get a map overview with enemy location and class (not always depending on the scenario), and you must decide who to place from your squad. Each character has a background history, likes and dislikes, and are in different classes. Not everyone will gel together and make an effective team. It is fun! But that's not the best part about the game. What truly makes this game special is the engine and the beautiful artwork. In an ocean of grey, and brown tone ultra-realistic shooters, Valkyria Chronicles has a soft watercolor painting like look which is very pleasing on the eyes. Sadly this engine was never used again. Still have a little doubt about the art? Let Luke Plunkett take it away. Valkyria Chronicles is definitely a game worth playing and checking out. It may not be for everyone but it's a gem on the PS3. Aw now I'm done, what about Valkyria Chronicles 2? Sadly, Valkyria Chronicles 2 is on the PSP and does not utilize the CANVAS Engine. VC2 sold far better on the PSP in Japan to create VC3 on the PSP once more. However, in the US, that's not the case and VC3 never made it to US shore (which many have said VC3 has the strongest story).